AL Sulaiteen Agricultural & Industrial Complex installed a banner. 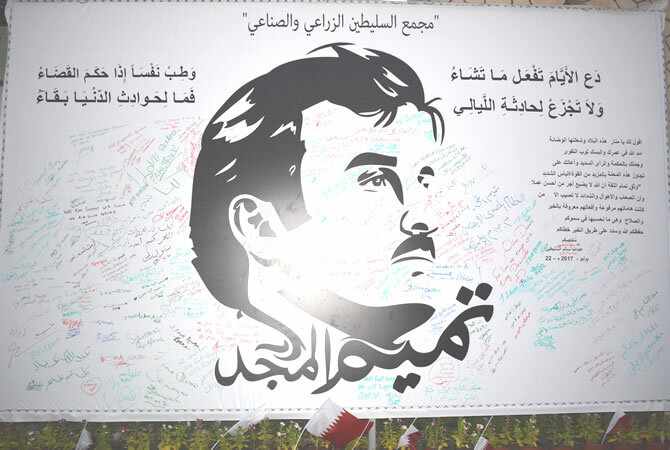 Of a mural of His Highness the Emir Tamim Bin Hamad Al Thani. The signing ceremony was led by the chairman Mr. Abdullah Salem Al Sulaiteen ,board members, his brothers ,sons as well as all employees and workers of the complex who from various countries of the world .The launching of the campaign of support came as an expression of support and solidarity from Mr. Abdullah AL Sulaiteen’s family members to demonstrate and renew their loyalty to His Highness Emir Tamim bin Hamad Al Thani. The ceremony program ended by posting poem of praise and encouragement by Mr. Abdullah Al Sulaiteen to His Highness Emir for his patience & wisdom that His Highness has shown in dealing with the blockade that Qatar state is facing. Office No 10, 2nd Floor, Building No. 02, Financial Square Al Emadi, Near Muntaza Signal, C-Ring Road, Doha, Qatar.